Commercially prepared liquid broths are available, typically for chicken broth, beef broth, and vegetable broth. In North America dehydrated meat stock, in the form of tablets, is called a bouillon cube. Industrially produced bouillon cubes were commercialized by Maggi in 1908 and by Oxo in 1910. Using commercially prepared broths allows cooks to save time in the kitchen. Many cooks and food writers use the terms broth and stock interchangeably, and even when distinctions are made, they often vary from person to person. 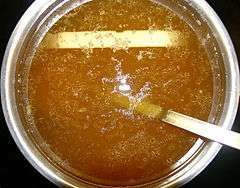 However, a traditional distinction between stock and broth is that stocks are made primarily from animal bones, as opposed to meat, and therefore contain more gelatin, giving them a thicker texture. Another distinction that is sometimes made is that stock is cooked longer than broth and therefore has a more intense flavor. 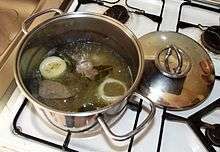 A third possible distinction is that stock is left unseasoned for use in other recipes, while broth is salted and otherwise seasoned and can be eaten alone. Bouillon is the French word for "broth", and is usually used as a synonym for it. In Britain, a broth is defined as a soup in which there are solid pieces of meat or fish, along with some vegetables. A broth is usually made with a stock or plain water as its base, with meat or fish added while being brought to a boil, and vegetables added later. Being a thin and watery soup, broth is frequently made more substantial by adding rice, barley or pulses. ↑ Rombauer, Irma S.; Marion Rombauer Becker; Ethan Becker (1997). Joy of Cooking. 1230 Avenue of the Americas, New York, NY 10020: Scribner. p. 42. ISBN 0-684-81870-1. 1 2 Wright, Clifford A. (2011). The Best Soups in the World. Houghton Mifflin Harcourt. ISBN 0544177797. I use the terms 'broth' and 'stock' interchangeably, as do many people, although technically there is a very small difference—not important to the home cook....Some English-speaking writers make a distinction between broth and bouillon, but bouillon is simply the French word for broth. ↑ López-Alt, J. Kenji. "How To Make Great Vegan Soups". Serious Eats. Retrieved 2016-11-29. I don't really want to get into the muddy details of nomenclature between broth and stock...I use the words pretty much interchangeably, though I lean towards 'stock' if I mean something pretty rich that I'm gonna cook with and 'broth' if I mean something my noodles or peas are already floating in. 1 2 Souder, Amy (April 10, 2016). "What's the Difference Between Chicken Stock and Chicken Broth?". Chowhound. Retrieved 2016-11-29. Professional chefs and experienced cooks like us spout the broth and stock terms interchangeably. ↑ Ruhlman, Michael (2009). Ratio. Scribner. p. 241. ISBN 978-1-4165-6612-0. Anytime you add liquid to vegetables and meat and heat it, you're making stock whether or not you want to recognize it as such. ↑ "Broth Basics". Martha Stewart. 2011-05-17. Retrieved 2016-11-30. ↑ Christensen, Emma. "What's the Difference Between Stock and Broth? — Word of Mouth". The Kitchn. Retrieved 2016-11-30. 1 2 Davidson, Alan (2014). The Oxford Companion to Food (3rd ed.). Oxford University Press. p. 112. ISBN 9780191040726. broth: a term which usually means the liquid in which meat has been cooked or a simple soup based thereon. It is a close equivalent to the French bouillon and the Italian brodo....It could be said that broth occupies an intermediate position between stock and soup. A broth...can be eaten as is, whereas a stock...would normally be consumed only as an ingredient in something more complex. ↑ Morell, Sally. "Broth is Beautiful". Retrieved 23 October 2014. ↑ Spaull, Susan; Lucinda Bruce-Gardyne (2003). Leith's Techniques Bible. London: Bloomsbury. p. 661. ISBN 0-7475-6046-3. ↑ Barham, Peter (2001). The Science of Cooking. Berlin/Heidelberg: Springer. p. 127. ISBN 3-540-67466-7.